While the Gothic style continued in northern Italy and the rest of Europe, a new, modern style was coming into its own in Florence and central Italy. In the Renaissance with its humanistic approach to life, man no longer stretched towards heaven but looked to himself as the measure of all things. The pinnacled lightness and elegance of the Loggia degli Ossi and the Duomo in Milano and the Oratory of S.M. della Spina that graces the Arno in Pisa gave way to symmetry and the pure sober lines of the Pazzi Chapel in Florence. Giovanni Battista Alberti’s ideas and those of Brunelleschi were applied not only to the building of churches and monuments but also to furniture design. Many armadi (closets) and credenze( cupboards) had the new architectural designs incorporated: Corinthian pilaster strips, square and diamond-shaped panels, dentellated corbels, shell-shaped niches and sustaining caryatids made many of them resemble miniature Renaissance palaces. 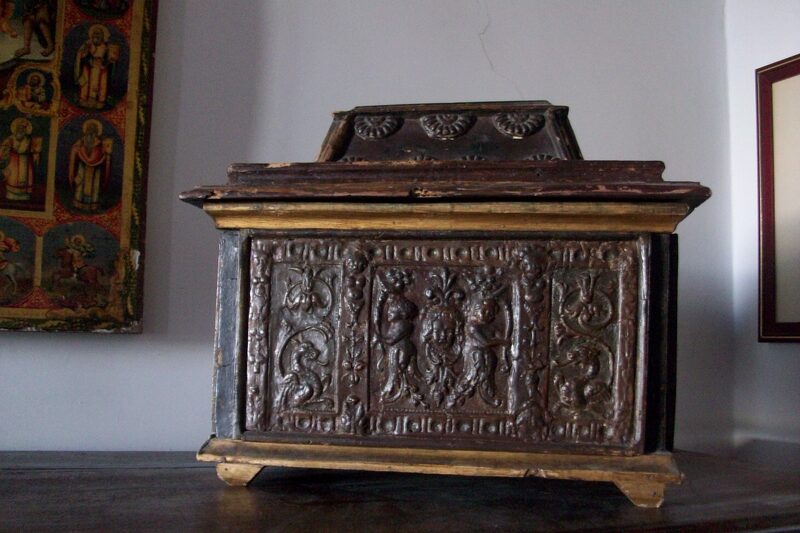 The cassone remained an important piece of furniture with its decoration and the inspiration for its shape and size seemingly borrowed from the Roman sarcophagus. Painted, pastiglia and intarsio decoration may have included representations of fantastic animals, sirens for example, acanthus leaves, stylized roses and other vegetal motifs-proof of the Renaissance love for classical themes. The cassone was transformed into cassapanca with a high back to provide seating in the ante-rooms of new palaces, or with cushions added it became the prototype of today’s divan or sofa. Upholstery was still a rarity but it did not matter since men and women wore such voluminous and well-padded clothing it was as if they carried their own upholstery around with them. Seating was also provided by new types of chairs. No longer was there only the simple stool (as in the Gothic home), but a profusion of chairs: X-shaped folding chairs, the Savonarola, the faldistorio in wrought iron with leather seat and back. The artist and artisan searched for new forms and in contemporary paintings we often see costumes and furniture of very unusual shape and design. An example is the three-legged revolving lectern chair featured in Carpaccio’s St. Augustine in his Studio . 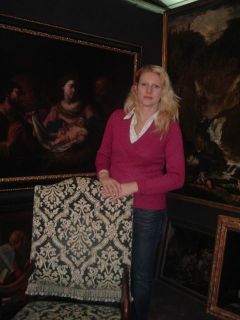 It was thought to be the artist’s invention, until a similar chair showed up in Venice a few years ago. A novelty was the seggiolone, a high backed chair derived from the Gothic throne chairs. They could be upholstered, cushioned or bare and the decoration on the traversal bands connecting the legs and backs were often ornate and sometimes gilded. The gold work soon darkened and vanished with the constant polishing received from ample skirts over the years. Chairs like these often boasted zoomorphic feet, stylized lions’ paws ,as did many of the chests and other pieces of important furniture. One pair originally made for a Roman palace had two “right” feet, while the other had two “left “ feet – a slip up of an inattentive apprentice centuries ago…and a good conversation piece. The use of perspective was another innovation used by Renaissance furniture makers. In wooden choir stalls and paneling the craft of the woodworker became art and artists like Piero della Francesca did intarsio designs. Perhaps the Studiolo of Federico da Montefeltro in Urbino should be considered art not furniture, but most will agree that it is certainly the supreme example of the intariso masters work. 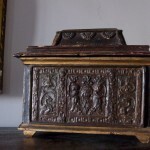 Other examples can be admired in Todi’s cathedral choir stalls and those of the Monte Oliveto Maggiore monastery. Most artisans were considered very highly in the Renaissance as Vasari tells us in an anecdote about Niccolò Grosso, the metal worker who produced the exquisite torch holders that still adorn Palazzo Strozzi in Florence. Nicknamed Il Caparra because he would not begin any commission without a down payment, (caparra) this blacksmith was so well thought of in Medicean Florence that even Lorenzo the Magnificent did not hesitate to visit his bottega…and give him a down payment. Metalwork, decorative keys, door knockers and locks, textiles with pomegranate and thistle motifs and other objects of the minor decorative arts – these are still findable and buyable by the collector of Renaissance objects while major pieces of furniture are only for museum budgets. Check my blog for more stories about antiques.